And so it came to be that we were invited to experience what was the talk of town when it launched - Nimisserie. A restaurant that has been simmering away on the backburners of Chef Nimish Bhatia's mind for a few decades now. We made our way to the fortress-like restaurant placed right behind the popular boutique Show Off on Castle Street on a sunny weekend. Nimish Bhatia belongs to that pantheon of Indian chefs that will go down in history. A force to reckon with on the culinary scene, his maiden independent venture in Bangalore is something many have been looking forward to. Naturally, the questions are many for chef. So what is aspect cuisine we ask and the simple answer is that food has many aspects and this is his on Indian food. The food at Nimisserie takes inspiration from across the country and he believes that everyone who comes in will find something they can relate to. Nimisserie offers you degustation menus of 7-11 courses, depending on tummy space you have. They also have an a la carte for you to pick and choose your way through. We were being taken through a degustation menu with picks by Chef and a few additions based on requests from around the table. The decor at Nimisserie packs in some serious bling - a lot of reflective surfaces that play with light in many ways ensuring the looks during the days and nights are vastly different. The day time though warrants seating closer to the open kitchen. 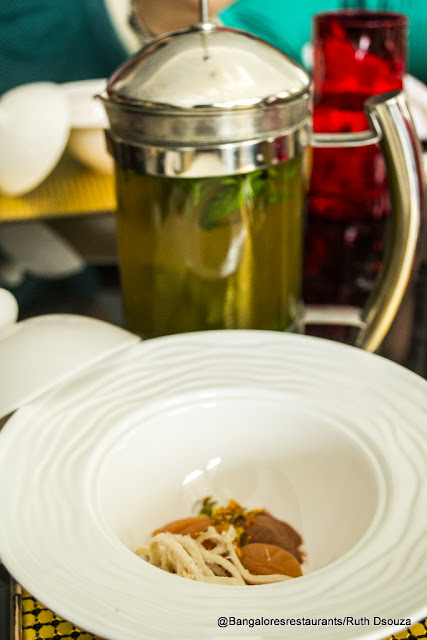 The arrival of the Amuse Bouche - a take on the classic Papri Chaat, with roe-like globules of pomegranate on a faux soup spoon set the base for a meal. 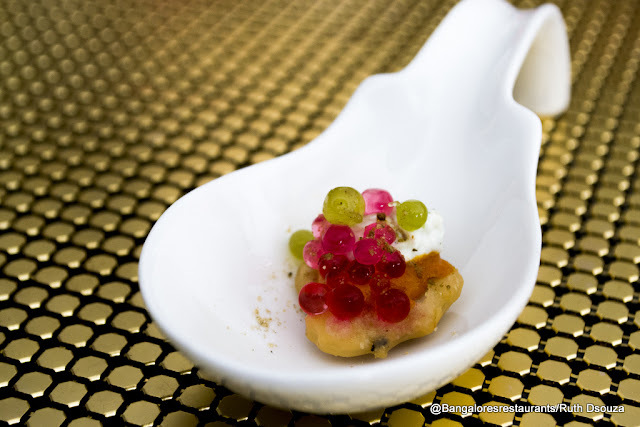 The mouthful is an interesting mix of flavours, everything that you would find in a Papri Chaat, just with different textures thanks to a bit of molecular gastronomy. 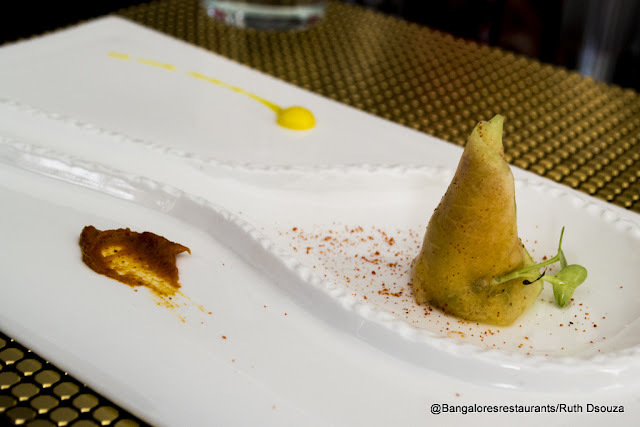 We then moved on the Cold "Appeteasers" which here was a Reconstructed Chilled Melon Samosa. The usual pastry shell is cast aside and is constructed inside a melon carpaccio, with the filling being the standard, savory aloo. 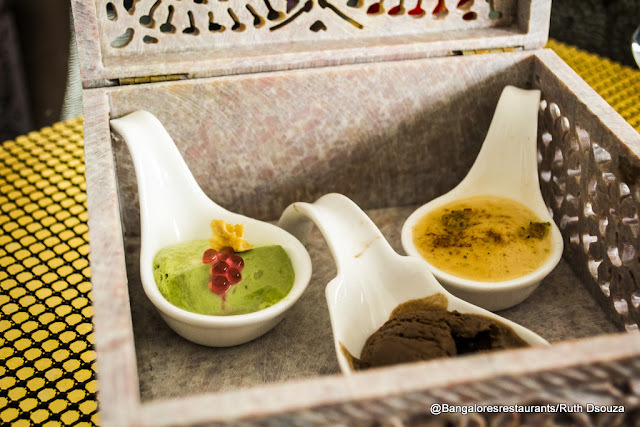 Sprinkled on it is some hibiscus dust and its served with generous smear of spicy Nimbu Chutney. It made a pretty picture on the plate, and the use of hibiscus dust added to the canvas, though it did not add to the flavour for me. The idea is lovely, and the dish came across as a nice aloo-melon chaat. I just wish that the base of this samosa was sealed in to hold the aloo which, for most of us, dropped promptly out of the melon when we picked it up. 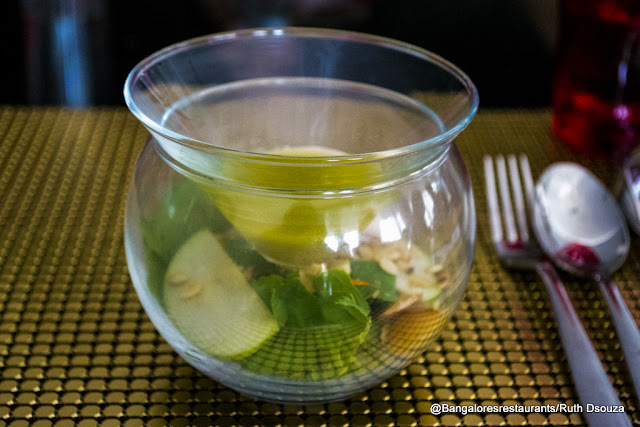 Next we had a salad served - Chef's idea is to put forth a series of dishes that takes turns in elevating the palate and then cooling it down. While one dish is supposed to wow you, the next would prep you for what is to come. And so this next was a Chicken Breast and Argula Salad, with Marigold, dehydrated pineapple and Basil, meant to cool the palate. It comes with a bit of show to it, what with the salad being trapped in with some hickory smoke. The salad was great, fresh, with interesting textures and those Arugula leaves!! !, though the dehydrated pineapple did not catch my fancy... my only question is how this fits into an Indian menu. Hot Appeteasers were up next - A Rohelkhand Style with Kachumbur with a Thepla on the side, a crisp tomato carpaccio and some truffle oil. In chef's words, this an answer to the hummus, though in my opinion a good dal can hold its own against any dish and does not really warrant a comparison. The dal is nice, with the thepla making for a nice spoon. Of course I was very generous with the lemon wedge provided and the carpaccio was an addition though nice, unnecessary. The Warm Trilogy of Nakhalawi Galauti was next - Three English cream horn shells, stuffed with Prawn, Chicken and Lamb and served with rose petals. I liked the chicken and prawn, followed by the lamb, that order specifically. The lamb was greasy and that's what made it a good combination with the pastry - more on the lines of a cone meat puff. The chicken was creamy and peppery and was my top pick. 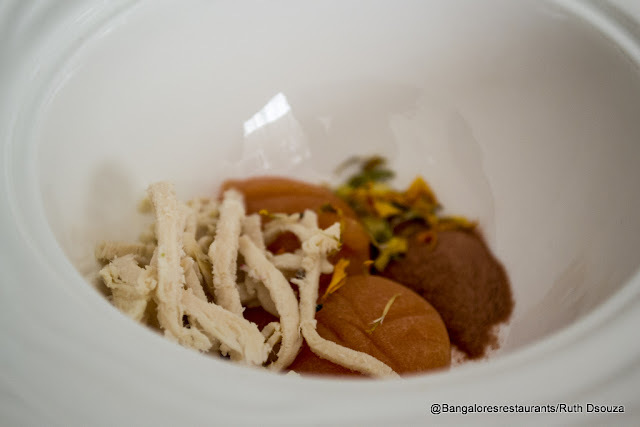 And then we moved to the Soup - The soup is plated up at the table and you are first served a covered soup bowl with chicken, tomato orbs created courtesy molecular gastronomy, some tomato dust and caraway seeds. The Chicken Confit comes in a canister where it is steeping, is pressed and then poured into your bowl. This was a great soup - flavour packed and the tomato orbs burst open to give way to a nice tomato juice touch to the soup. There are a range of Naans that come from the "Naanerie" - We sampled the Bacon Naan, the Apricot and Chilli Kulcha and the Chilli Chicken Kulcha - all of which I found pleasant - yes, I am saying pleasant for the Bacon Naan - for once something bacon did not blow me away. 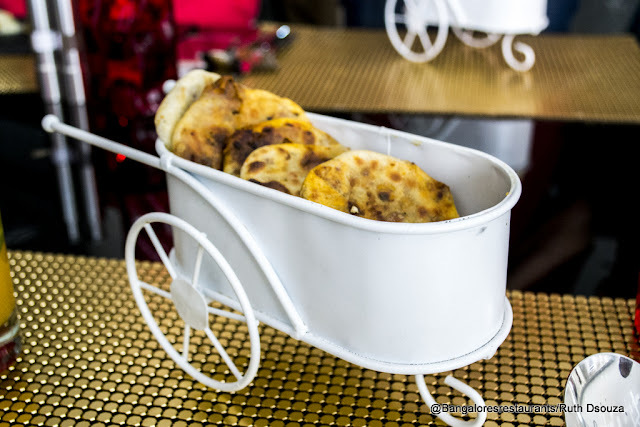 All of the naans come in cute little pushcarts. And each of naans will make a good munchie to have with a drink, once the restaurant secures its bar license. Main courses began with the Fishy Affair - A Trio of Fish, which will be seasonal and fresh produce based. 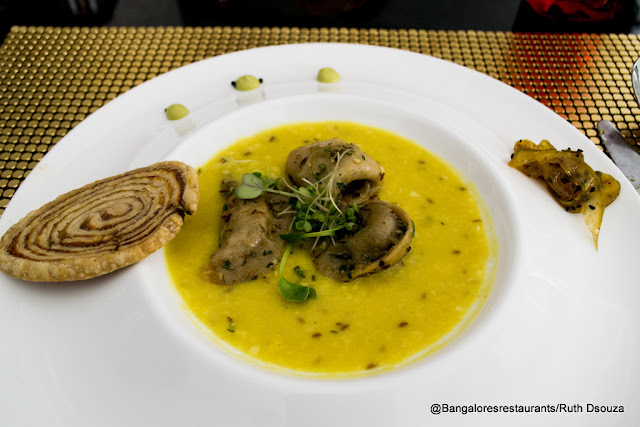 We had the Kasundi Grilled Snapper, Gooseberry Chutney Tuna, The Curry Leaf Pesto Seer fish, each topped with a bit of Lemon Foam. 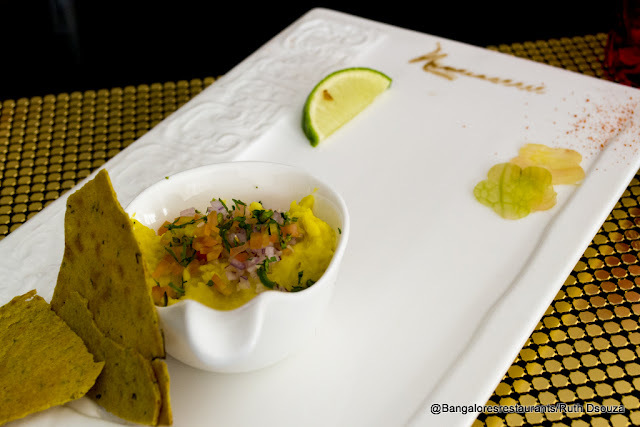 A nice dish this one, with the Kasundi Snapper topping the list. The curry leaf pesto was good and the lemon foam, for me, again totally unnecessary. Moving on to the Bihari Pithi Pockets (like Ravioli, Chef says) stuffed with Spinach, Cottage Cheese and Flax Seed placed in a base of dal. You see a mango relish to one side - an Indian staple of Bakharwadi on the other. I found the pockets a little too thick to completely enjoy the filling. But then that may have been because of the thought of Ravioli in my head. All the elements of the dish were nice. We also had the Truffle Oil Chicken Tikka, stuffed into the classic Deele Aate ki Paratha and served up with a customized Makhani Sauce. I completely loved this dish, especially the sauce, since it packed quite a punch of chilli in it. with a Makhani Sauce a la Chef Nimish. Chlorophyll (read Coriander) Panacotta with Sago Pearls, the Tarte Tatin Mishti Doi and a Salted Caramel in Chocolate ice cream. Chef also has an interesting Teppanyaki-like concept of the Tawakerie going on, on the first floor. A place where you can interact with chefs and have your dishes customized to your liking and served right off the grill. He has also created his own rotater tandoor that he has christened the Kebaberie - samples of which I would have loved to have. 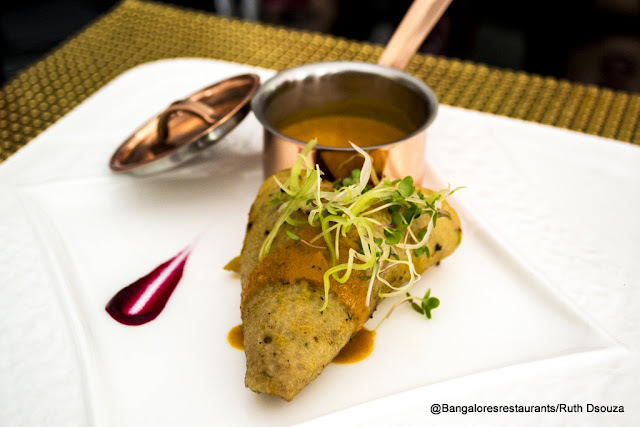 Nimisserie is an experience as far as Indian food goes. I found the leanings more toward North India. Chef believes that each person will take away something different from a meal here. For me, it came across as fusion - of Indian food with possible international counterparts of a dish. 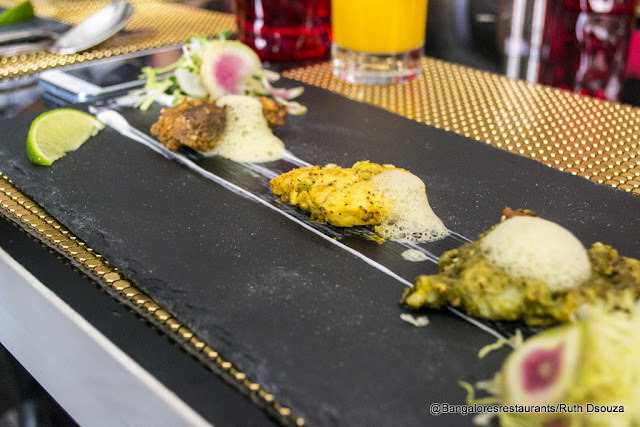 It brings international techniques, especially molecular gastronomy to Indian cuisine, which is already elaborate in terms of preparation. The multiple elements to a dish warrant an explanation if one were to truly appreciate it, which Chef will spend ample time on. While an international audience would perhaps love this take on Indian food, I personally found it trying a little too hard to please, beginning with meaningless word plays with names. 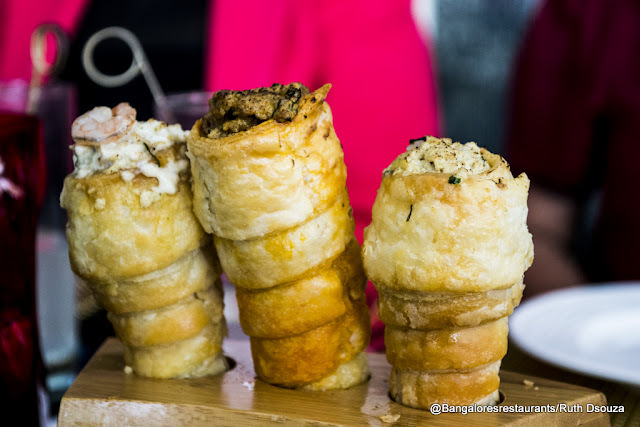 I would set aside all the frills and simply dig into food that basically has some great flavours going. Nimisserie is something to try at least once. There is just so much to experience for each of your senses. A meal for two here is approximately Rs 3500. Loos are on the first floor and are clean.